Welcome to the University of Wyoming's Louis O. And Terua P. Williams Conservatory! 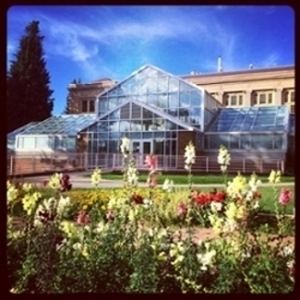 The Williams Conservatory is a prominent facility at the University of Wyoming, attached to the historical Aven Nelson Building, and situated adjacent to Old Main and the University President's Office. It was built in 1994, and was funded largely by private donations from the Williams, whose generous gifts made construction possible.. The National Science Foundation (NSF) also contributed grant dollars specifically for the enhancement and maintenance of research. Since opening in 1994, the Conservatory has served as a place of learning and an oasis of tranquility for many university students, faculty, staff and visitors. The facility receives hundreds of visitors each year from the University community, visitors, foreign dignitaries, and local residents. The Conservatory is a multipurpose facility, primarily serving the Botany Department, though is open daily to the public and is available for other uses upon request. The building and staff are organized to serve the three pronged mission of the University of teaching, research, and outreach or service. Multiple University classes use the facility each semester, using the growing space or sampling from the permanent plant collection. Simultaneously, various faculty and advanced degree students are completing research activities in greenhouse space. The Conservatory staff meanwhile are also hosting school groups, professional organizations, and other small groups who regularly tour the facility, as well as providing horticultural advice for local residents, propagating plants for sale, and caring for the permanent plant collection. Louis and Terua Williams were supporters of the Botany Department for many years. 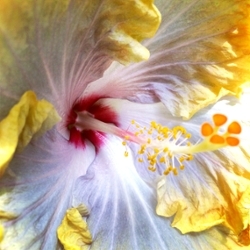 Terua met Louis in Jackson Hole, Wyoming, where she was a school teacher and he was an aspiring botanist. Under the guidance of Aven Nelson, Louis earned his B.S. and M.S. degrees in our department. After receiving his Ph.D. from Washington State University, Louis' career took him to Harvard University, the Panamerican School of Agriculture in Honduras, the U.S. Department of Agriculture, and the Field Museum of Natural History in Chicago, where he was head of the Botany Department. He retired in 1973. For many years, Louis was the editor of the Bulletin of the American Orchid Society. Because of Louis and Terua's generous support, UW was pleased to name the conservatory in their honor. Meredith Pratt took over management of the Williams Conservatory in September of 2015. As a former student at the University of Wyoming, she received a Bachelor’s of Science degree in Zoology with a minor in Insect Biology. Her interest in plant and insect interactions resulted in past work with Wyoming’s Cooperative Agricultural Pest Survey (CAPS) and her last position as the IPM and Compliance Coordinator for Red Sun Farms, LLC., a large commercial greenhouse company. Her goals for the Williams Conservatory include creating an educational self-guided tour for visitors who venture into the conservatory, construction of various plant science lessons to offer as field trip opportunities for public and homeschool groups, and enhancing community participation.